VIOLA GRIFFIN was born September 14, 1910 in Marshall, Texas to Bishop James and Fannie T Tooke. Both parents and five siblings preceded her death. She was raised by her grandparents, who stressed the importance of serving God and getting a good education. She accepted Christ at a young age in the Methodist Church. 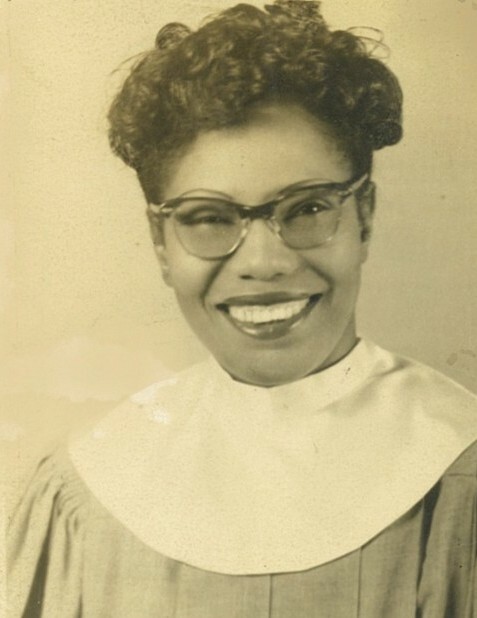 Later as an adult, she was baptized and became an active member of the Missionary Baptist Church. Viola began her study of nursing at age sixteen. She attended Wiley University in Marshall, Texas. She continued her education and worked early on as a medical nurse. Later she became part owner of "The Colored Funeral Home" in Shreveport, Louisiana. About the same time, she married her first husband, Joseph Benzo, who passed away in 1943. Later in 1943, Viola moved to San Diego, California, where she worked as a nurse and later as a civil servant, traveling and doing some undercover work. She continued learning and took many different classes on many subjects. In 1944, she united with the Mt Zion Missionary Baptist Church Family. She was a faithful member serving more than sixty years. She served in the health unit, the usher board and as Sunday School teacher and as a teacher’s teacher. Viola was wed to Mr. George Griffin in 1968. He passed away in 1999 after more than thirty years of marriage. Viola retired in 1970 and remained active in her church and community. She served as block captain and volunteered at several of her favorite nursing homes, and driving others to doctor’s appointments or grocery shopping. Viola loved walking, eating out, tinkering in her plants and garden, and used every opportunity to share Jesus with others. Viola held a valid driver’s license and a valid nursing license after the age of one hundred and three. Viola never had children of her own, but took care of her youngest sister after their mother passed away. Many of the children from the neighborhood would always come back from college or military service to visit with her. She was an awesome child of God and always gave praise and thanks unto his name, regardless what the situation was. When others asked her secret to her long healthy life she always said "God's Grace and Mercy"! Although, she was not shy, telling others what she thought they needed to hear. She was respected and deeply loved. She will be truly missed by her friends, Frances and Anabel; her cousins, Maxine, GG and Alfonso; her special nieces Carla and Wondra; her play sons, Butch and Tuffy, her many neighbors, friends and church family.